Have you gone apple picking yet this fall? I hope so! 'Tis the season after all. 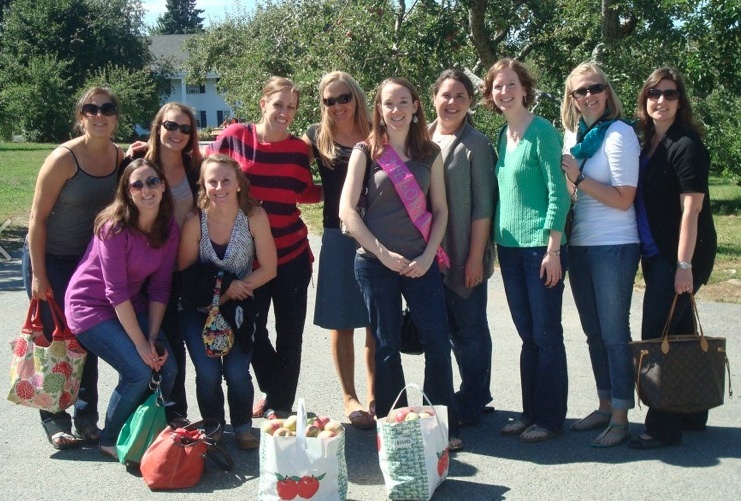 ;) I was fortunate enough to go apple picking while on my bachelorette party this past weekend. So much fun! Since I came home from the weekend with many apples, obviously I had to bake with them! 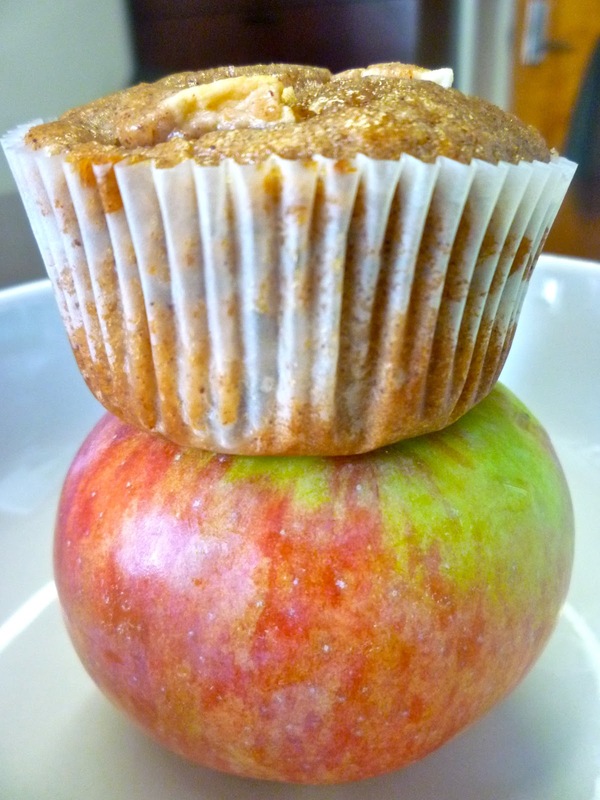 The funny thing is that the first thing I baked (these muffins) only used two apples though. So I have a several more to use up...or eat! This recipe is adapted from King Arthur Flour. I made a couple small changes though. Instead of dark brown sugar, I used light brown sugar. And instead of buttermilk, I used vanilla yogurt. Preheat oven to 375 degrees. Grease a muffin pan or line with paper liners. Mix together the flours, baking powder, baking soda, salt, and cinnamon; set aside. In a separate bowl, cream together the butter, sugar, and brown sugar. Beat until fluffy. Add the egg and mix well. Mix in the yogurt gently. Mix in the dry ingredients until well-incorporated, and then stir in the apple chunks. Divide the batter evenly among the muffin cups, filling about 2/3 to 3/4 of the way full. Sprinkle the tops with additional brown sugar. Bake for 15 to 20 minutes, or until a toothpick inserted into the center comes out clean. Remove from oven and let cool for 5 minutes in pan before removing to cooling rack to cool completely. I actually put some batter into my super fun muffin top pan too, and I ended up making 4 muffin tops and 11 regular sized muffins with this batter. See that muffin in the front right of this photo? Yeah, it's half eaten. I did that. I just couldn't resist when it was warm, fresh out of the oven!! 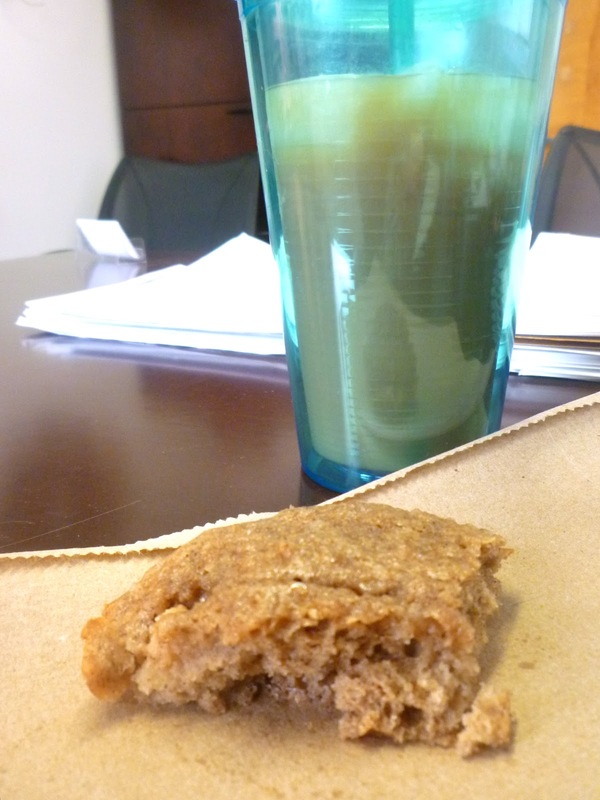 I forgot to take pictures of the muffins and muffin tops before I brought them to work to share, so I just took a few pics of the muffin top that I enjoyed at my desk for breakfast. I looove the muffin tops! They're so fun and light n' fluffy. If you don't have a muffin top pan yet, you should strongly consider purchasing one. It's awesome! These muffins had great texture, lots of flavor, and were very moist. A keeper of a recipe, for sure! A picture of the ladies at the orchard from my awesome bachelorette weekend! !